The Shaia’s family has built a successful business four generations strong in their small boutique in Downtown Homewood. Having already designed the Main Street storefront and interior fit-up, the architects were asked to design a remodel for the adjacent storage building as an annex that would extend the existing store’s retail area and organize its back office spaces. The design challenge was to open the annex space to the main store visually, despite an obscuring structure and floor elevation difference. The designers re-worked the structure to allow for a single, wide opening between store and annex. Carving out simple and functional spaces, highlighted with daylight from the ceiling, the architects visually and physically extended one space into the other. 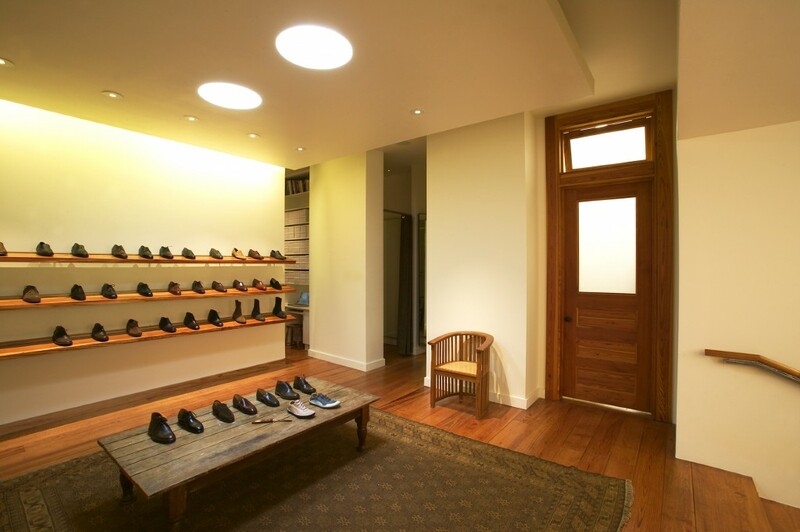 Within the shoe annex and adjacent fitting rooms, the architects designed wood shelves, steel framework and fittings for mirrors and display fixtures, all of which were hand made by local artisans. By combining modern details of raw steel with warm rustic wood and plaster, the annex embodies the true spirit of the store and its sophisticated men’s apparel.